After graduating from the United States Military Academy with a B.S. 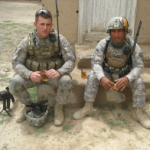 in Economics in 2008, Lance was commissioned into the Engineer branch and assigned to Alpha Company (Sappers) of the 173rd Special Troops Battalion in Bamberg, Germany. While with Alpha Company, he served as a RCP platoon leader during OEF X, an Assault Obstacle platoon leader, and company executive officer. Currently, Lance is pursuing an MBA at the University of Chicago Booth School of Business. Lance is eager to give back and happy to help any veterans planning on making the transition.